Adult female Neanderthal skull from Forbes' Quarry, Gibraltar. One of the highlight specimens in our Human Evolution gallery is the fossil skull known as Gibraltar 1. It is the first adult Neanderthal skull ever discovered. 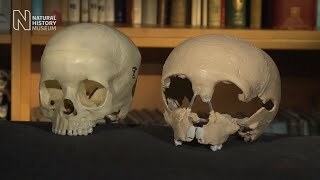 Model-maker Jez Gibson-Harris and acoustics researcher Anna Barney join human origins expert Professor Chris Stringer to tell the skull's story and explore what our ancient human relative was like. The skull was found in 1848 in a quarry in Gibraltar. Its significance wasn't recognised at first. But eight years later amateur naturalist Johann Fuhlrott identified a similar skull and additional remains in the Neander Valley in Germany. 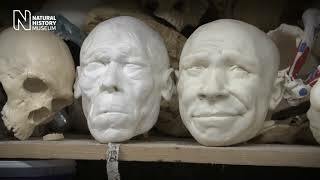 In 1864, it was named as a new species of human, Homo neanderthalensis. The sensation this caused meant the first skull was revisited, and it too was found to be a Neanderthal fossil. Neanderthals are one of our closest ancient human relatives. In fact, genetic data suggest we share a common ancestor. 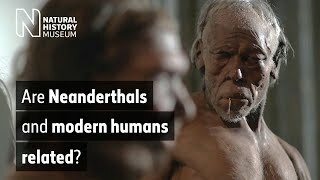 Neanderthals began to evolve in Europe and Asia while our own species was evolving in Africa. Thanks to hundreds of fossils unearthed in the past 160 years, and recent DNA evidence, scientists have been able to build up a detailed picture of what Neanderthals looked like. You can examine a scientifically accurate life-size Neanderthal model in the new gallery. Their short and stocky physique was suited to the cold environments they evolved in. Distinctive hefty brow ridges and a large nose dominated their face. We know from fossils - including the Museum's Swanscombe skull specimen, which contains imprints of the folds and blood vessels on the brain's surface - that Neanderthals' brains were as big as ours but shaped differently. Undoubtedly intelligent and able to communicate, they were innovative toolmakers and skilful hunters. One of the last Neanderthals? Physical evidence of Neanderthals ends around 40,000 years ago. Two main factors may have contributed to their extinction: an unstable climate and competition from another human species (us). Fossils and archaeological evidence indicate that Gibraltar may have been one of the Neanderthals' last refuges. The area has had a mild and stable climate for the last 125,000 years, unlike northern Europe, where extreme cold stages made the land uninhabitable at times. The Gibraltar 1 fossil is thought to be about 50,000 years old, but the dating isn’t very precise at the moment. Museum scientists are working with dating and DNA labs to accurately calculate the age and recover part of this Neanderthal's genome. If successful, the specimen will be the most southerly Neanderthal for which we have DNA. It may help to answer questions as to whether Mediterranean Neanderthals were genetically different to Neanderthals from the north. The skull that Charles Darwin studied and called 'wonderful' back in the nineteenth century still has secrets to reveal.